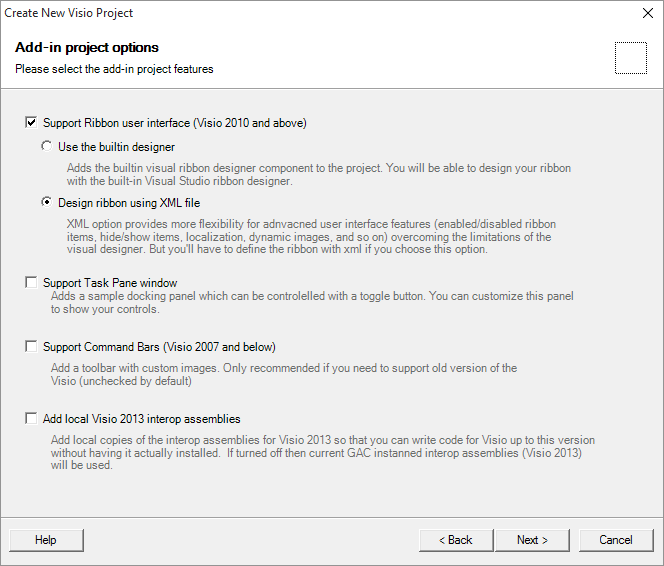 If you want to create a Visio add-in, there are several options available. 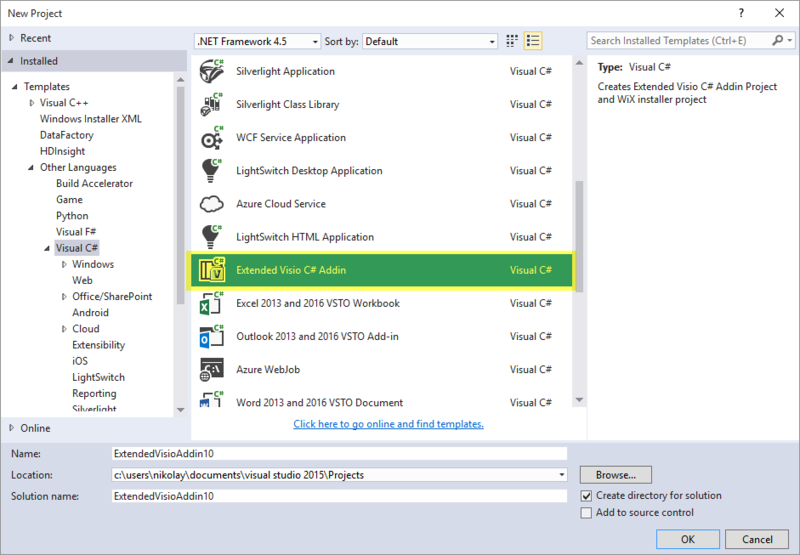 You can go with plain COM addin, VSTO (Visual Studio Tools for Office) addin, or with a VSL. This project template provides an improved starting point to build managed Visio addins with Visual studio (including free Visual Studio Community Edition). – The basic addin project, based on VSTO or COM. 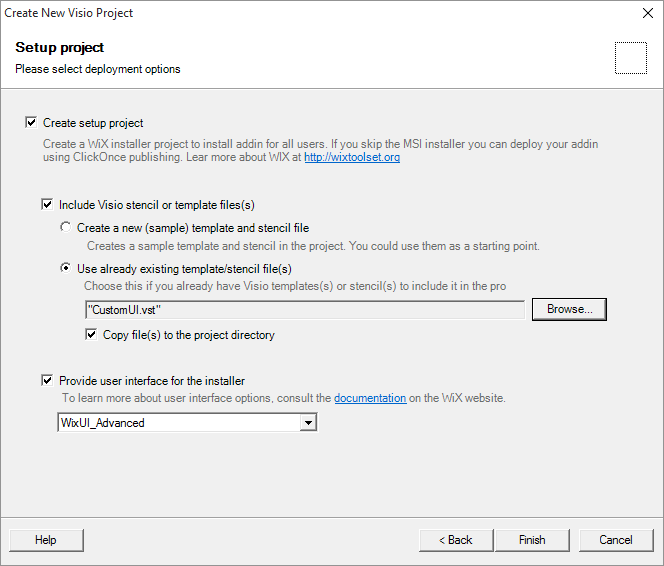 – Installer project, which is fully customizable (based on WIX) where you can select to install additional Visio files such as stencils or templates. Or additional DLLs. Or PDFs. Or whatever. The installer can publish your stencils and templates to Visio, so that they are available as built-in templates. You just specify the files, the wizard takes care of the rest. If you want to customize names/folders/versions you can still do so afterwards by modifying it in the generated project. – Custom images support code for the buttons. You can change them, or design your own based on the example. 3. The project wizard opens. See options below. 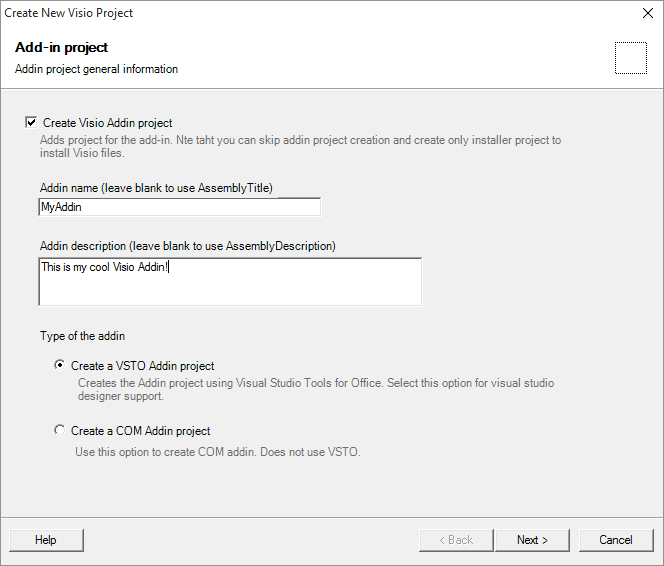 You must check this if you want to create a Visio addin project. Note that if you deselect this option, then you still will be able to proceed. This may be what you want in case you want to create an installer to install (publish) just some Visio files (such as stencils or templates). The wizard will let you select those on the next steps. 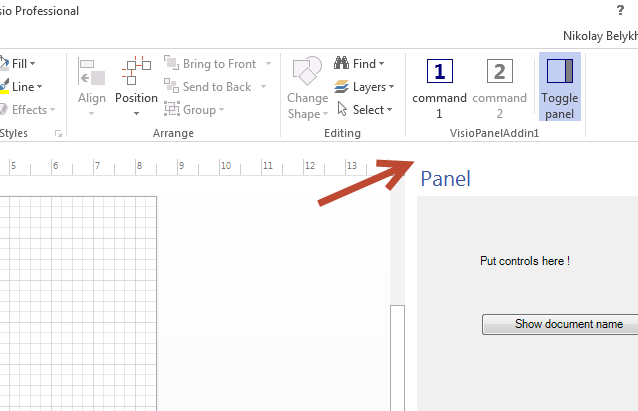 Specify the name of the Add-in to be shown in Visio User Interface. The description of the addin to be shown in Visio User Interface. The type of the addin to create. In most cases, the VSTO addin is recommended. If you are in doubt, just select it. You may want COM (in Visual Studio that’s called “Shared Addin”) if you migrate your old code, or if you want to support something like Visio 2013. 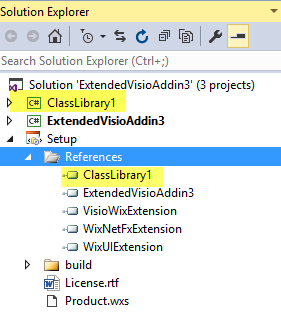 The visio files to be deployed along with the addin. These files are published (this option works identical to Visio solution publishing). By default, the stencils/templates are published for all Visio versions, for all languages. You can fine-tune your stensil/templates afterwards by changing attributes of the corresponding <Publish> element. You can also add stencils/templates afterwards, i.e. this is a convenience feature. If checked (default), the installer will include some (selected) user interface. If you uncheck this, the installer will not include any UI. For the details on UI, please refer to wix UI interface options. You can specify the language of the installer (should be one of the supported languages). Note that if your installer includes files with non-english symbuls, you should select the language where these symbols are valid. Like, select “ru-RU” if you have files with cyrilic symbols. For VSTO project type, just hit F5, the debugging should start automatically. For COM project type, first build the solution and install the project. To ease debugging, the default project has “Register for COM interop” option set in debug configuration (this will register the addin automatically at project location instead of installed location after you build it). Note that you’ll need to start Visual Studio as Administrator for this to work. Also note that by default latest Visio is selected for debugging (if you have more than one Visio versions installed). You can change that in the project settings. The start-up project consists of a few classes. Some of them are generated or note depending on the checkboxes set on project creation. ThisAddin – (always generated) is supposed to contains startup functionality of the addin, and the code. AddinRibbon – generated if ribbon support was selected; defines infrastructure needed to support the ribbon. AddinCommandBars – generated to support Command Bars UI (for old versions of Visio), if selected. PanelFrame, PanelManager – (if you have selected to include task pane) – helper classes to support task pane integration. TheForm – The form to be shown in the task pane. This is the class to define your user interface for the task pane. If you have selected to use ribbon designer, just add a button to the ribbon using the designer. To create handler, double click it.. Simple as that. You can just modify the Addin.cs file OnCommand/IsCommandEnabled/IsCommandChecked to process the command. Note that there is no need to define all handlers; you can keep only the ones you need (if you don’t need dynamic images or dynamic text, don’t add OnGetRibbonLabel/GetRibbonImage). The processing is done in the Addin.cs to have common place for ribbon/command bars, to support also old versions of Visio. Command bars interface: Add the new command ids (string) it to initialization list of StartupCommandBars() function. Process them in the Addin.cs OnCommand/GetRibbonImage/etc. You can configure templates/stencils after adding them, to specify names/locations where they should be made available in Visio user interface. You have autocomplete in the project to help you with this. For example, to publish the same stencil under different names depending on Visio language, you can do (note that this is artificial example, normally you should create 3 stencils, and publish them with corresponding languages). Also this will move first 2 shapes as “Quick Shapes”. This example address the case when you in addition to the addin dll, have other dll project you want to include in the (WIX) setup. The best way to do this is to use project reference. Hi. Thanks for putting this together. I have been using the VB .net VTSO version for a while now and it’s been great. I have just encountered a problem though on a mew machine with .Net Framework 4.6.x installed. Visual Studio upgrades the project as I don’t have .Net Framework 4 and from then on I can’t build the solution without errors that I can’t resolve. Do you know whether your template supports .Net Framework 4.6.x or above? That would be awesome. I am completely stumped, but then again I am a wannabe developer (now). I can’t want, thanks so much!!!!!!!!! Which version of Visual Studio you are using? Do I understand correctly that it is 2017, but which edition? I spent hours last night trying to get a new clean solution working and all the time I must have been crazy because now I test it I can build a new clean solution without any problems. Just discovered that it was the C# version of the extended addin that has no problems with the .Net framework. The VB version errors with .Net 4.7. Have you noticed this at all? Awesome!!!! Thanks so much mate. Now to migrate my code across. I really appreciate the help with this. Are you able to share that the solution was to fix this problem? when i use the VSTO add-in with Visio 2016 and Visual Studio 2017 it works directly, with the COM add-in option I can build a dll but when I try to add the COM add-in to Visio is tells me it’s not a valid Office add-in? How do I make the COM add-in option work with Visio or did i miss some steps? Sorry for the delays with replay. You need to install COM add-in to make it work 🙂 This will register the add-in for Visio. First, please make sure you have the checkbox for the installer checked, then build the solution, then install. “Add” works only native addins, as far as I know (it does not work for .NET-based addins). 3. INSTALL the addin. Go to the installer’s bin folder, and run it.